I would like to welcome Jill Arnow as our newest Featured lifter. Jill, flew across country, back to her home state to compete at the 2012 USAPL Massachusetts State Championships. For the first time in her career she was able to lift in front of her home town crowd and she did not disappoint. Despite a long recovery from a neck issue, Jill was able to bring her “A Game” and win the best Raw Female Lifter award. I grew up in Lexington, MA, attended public schools in Lexington through 10th grade then graduated from the Cambridge School of Weston. I got my BS from UNH and then an MS Cornell before moving to Seattle. I worked in the tech industry, as an artist, and for several non-profits before going back to school two years ago, and received a Masters in Public Administration last year. Mostly by accident! I starting going to a gym in Seattle as part of my recovery from surgery for thyroid cancer. The gym happened to have a lot of powerlifters there including Willie Austin, Bull Stewart, Grant Higa, and Paula Houston. 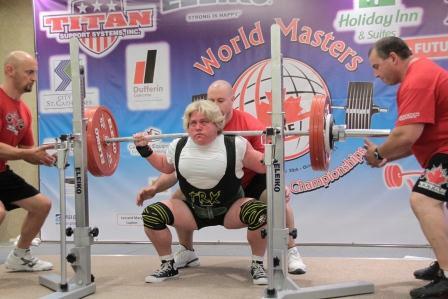 I had never heard of powerlifting at the time. Paula was my personal trainer and I went in to train on 9/11 because I couldn’t imagine sitting home all day watching the television. Paula suggested I try squatting as a way to grounding myself on that horrible day. I did. She followed with “you should compete, you’ll probably win.” And so I did. I’ve traditionally been in the 90kg class, although I’ve gone up to the 90+kg class from time to time. With the new weight classes, I’m planning to go down to the 84kg class. My best competition lifts in gear: squat 192.5 kg, bench 137.5 kg, and deadlift 188 kg. I currently hold over 30 Washington State records, 12 American records, and 3 world records. 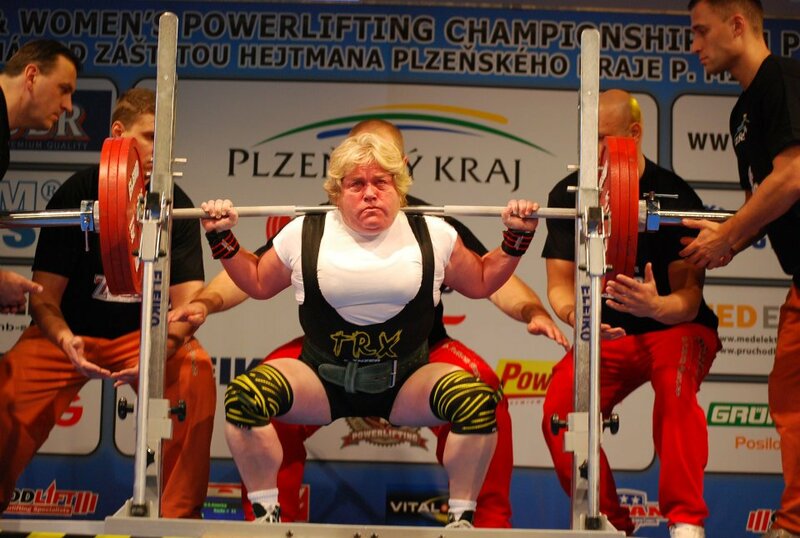 Have you lifted in any NAPF o r IPF meets if so how did you place? Had hoped to lift in last year’s NAPF Regional Championship but when an injury took me out of the meet, I went anyway and got to meet all the Boston area lifters there. I train at Seattle Strength and Power ( www.seattlestrength.com ), owned by my coach, Todd Christensen. It’s a hard-core gym in the basement of an office building catering to powerlifters and strongmen of all ages. Most of the time there’s a group of people working out at the same time. 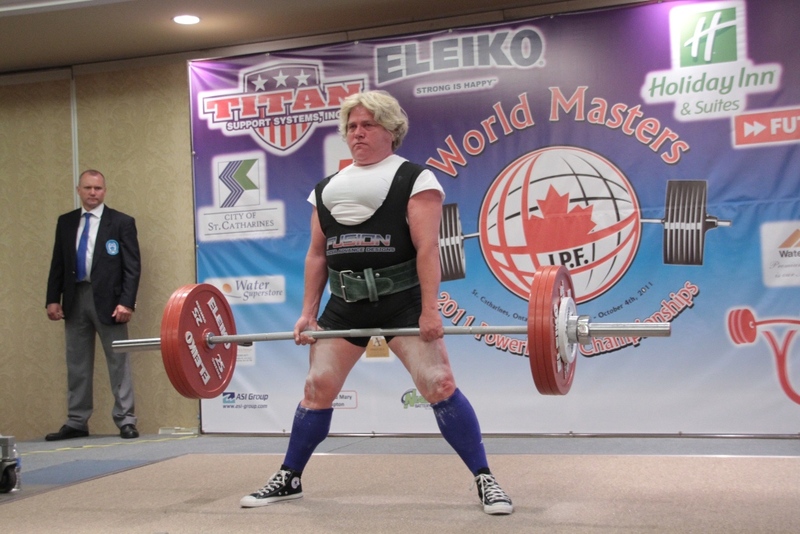 There used to be a larger group of USAPL women training there, but now it’s a mix of master’s women training for USAPL and guys who are either lifting USAPL, WABDL, or other single or double ply federations. It’s a great place to be able to achieve your best amongst people who are working on their bests as well. These days, my biggest goal is to stay healthy and injury free. Having just competed in December in Rockland, I have a few goals for my raw numbers. I recently pulled 400 raw for the first time. But, my next competition with be Women’s Nationals and I’m hoping to up my American records as well as make the Master’s World team. What is your greatest moment in powerlif ting? Setting records is always a great moment, especially a world record. Having to make a third bench press attempt to stay in the meet and getting it felt great. Being named Washington State Athlete of the Year and nominated to the state Hall of Fame were both great honors. But, I think coming in 5th at IPF Open Worlds’ in 2011, despite being the smallest and oldest in the field meant the most to me. Broadly, I squat at least once a week and bench once a week. I pull anywhere from every other week to less than once a month. I do a lot of assistance work with chains and bands. But, often I have to work around pain or injury and we do a good job of keeping things interesting and heavy enough to keep making gains. Todd Christensen, who has been my coach for most of my lifting career, has been the biggest influence on my lifting. All the folks in the gym are incredibly helpful and supportive no matter what anyone is doing. We can all give each other pointers and call depth for each other. Also, I credit Grant Higa for getting me comfortable with squatting early in my career. Grant has a beautiful squat and as a professional strongman, I always knew he’d be able to catch me if I got stuck on a squat. As a result, I was never afraid to push the weight on my squat. I think my best suggestion is to have fun. Anyone who has ever seen me at a meet knows that I’m always focused, but relaxed. If you’re well prepared and know what you’re doing, the best thing you can do is to get out of your head, and do what you know how to do. 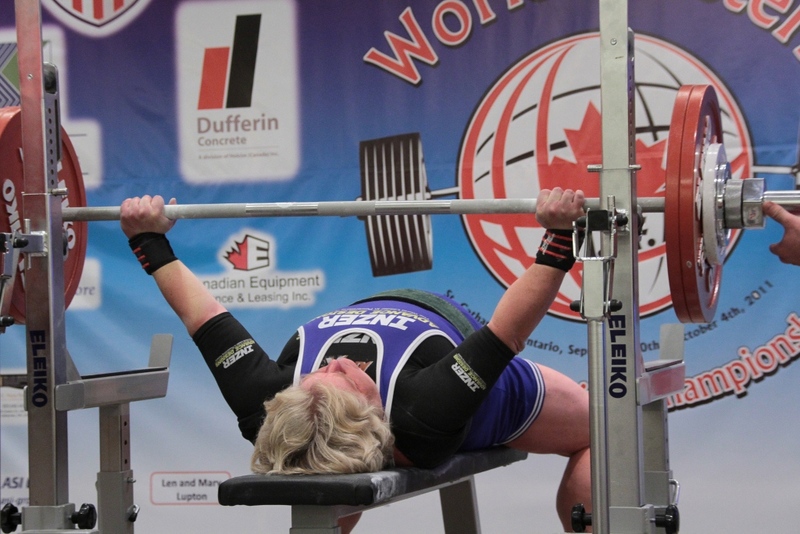 I love watching lifters, like Liane Blyn, who lift hard and enjoy themselves while doing it. There are two sides to this – the first is that I’m incredibly competitive and I’m not willing to give up. The second is that I’m much happier when I have the endorphin rush from lifting. Seattle is a gloomy place in the winter and anything that helps my mood is critical. There are always battles over the music in the gym! I tend to stay out of it and can put up with anything other than easy listening or AC/DC for the 40th time. If I listen to my own music at a meet, I tend to listen to a mash up of things that either get me pumped up or make me laugh. I had a blast at the Mass Open last year, and don’t be surprised if you see me back in Massachusetts in the near future. And, I’d like to thank John Inzer for his support through the years; I’ve done well through the years in Inzer gear and John has been great.